Sakuya was my first real REM god (I semi-started with a Gabriel ) and it completely changed my playstyle and enjoyment of PAD. She has carried me through countless descends and I still choose to use her in my most challenging encounters. Sakuya has always historically been one of the top tier leaders and only began to fall out of favour within the last 6-8 months due to powercreep and the advent of TPA mono-colour teams. Mono-colour leads such as Shiva provide almost the same multiplier, but are able to focus on one colour and utilize TPA and numerous orb changers. (I go into more detail on the strengths and weakness of rainbow teams in a previous Guide I wrote.) But the long and short of the matter is rainbow teams with the exception of Ra and Ra Dragon are currently underwhelming in terms of their damage potential due to relatively low multipliers and colour restrictions. However, Awoken Sakuya now rejoins the ranks of top tier leads as her leader skill now scales with each additional combo starting at 6. As such, can now reach 100x damage at 10 combos provided her four colours -red, blue, green, and light are triggered. Leader Skill starts at 25x for basic four-colour match and increases by 1.2x at 6 combos and an additional 0.2x per combo beyond 6, and caps at 2x at 10 combos for a combined 100x damage. Gains uses as a sub and is no longer restricted to a lead. As with any rainbow lead, the risk of orb troll/bad boards can be the difference between victory and defeat. Thankfully, Awoken Sakuya gains a fast-scaling multiplier and even with only 3 light orbs, can still produce very high damage with 7+ combos. Overall, this new evolution is a massive upgrade to all Sakuya users in terms of damage, team building, and utility, but it comes at the price of a higher skill cap. Sakuya teams have historically been relatively REM light, and with her new awoken form covering blue, she only needs to cover red and green, which makes team building and REM dependence lower. I will try to cover all the best subs to use along with sample team builds. At the end I will also address the popularity of a dark based-Sakuya. Offensive Orb Changers: Offensive light orb changers make fantastic subs on teams as they will allow you to condense your board along with making numerous TPA matches. Valkyrie is probably my favourite green sub for Sakuya and was my second hyper maxed monster as her synergy is amazing. Sporting two , , and awakenings along with high base stats, makes this lovely lady one of the best farmable monsters in the game. A relatively easy to skill up 5-turn hearts to light active allows for rapid activation and burst damage throughout a descend. Her chibi form is superior from an awakening point of view because of the lower reliance on and emphasis of for Awoken Sakuya. With that being said, the chibi valkyrie is a rare pull from a special REM, placing her out of reach for the average player. Chibi Valkyrie has the same active as her larger and prettier counterpart. The chibi form does pull ahead due to her triple , , and awakenings but, as mentioned above, is very hard to obtain. If you are fortunate enough to pull her, she should be heavily invested in as she will be most likely your hardest hitting sub. Pollux is a part of the Mechanical Star God series and offers a 7-turn orb changer that converts heart, jammer, poison, and mortal poison orbs into light along with 1 turn haste. This is similiar to Elia in terms of cooldown duration and haste effect. It is hard to say who is a stronger option as I am loathe to remove heart orbs but the removal of jammers and poison orbs is very tempting. In addition, has 2 , 2 , and the rare 2 awakenings. This opens up sub flexibility as you can choose cards who are missing a while the offers passive damage to your other light cards ever turn. Lastly, with the an ultimate evolution coming at some point in the future, stands to become a powerful sub. Elia is the definition of a luxury sub as she requires an unprecedented amount of effort to become viable with a 7-turn dark-to-light orb change with one-turn haste. Farming for skill ups let alone invades is a nightmare, and are perhaps better off by using . Effort aside, Elia has incredible power on an team because she not only removes the dead purple orbs, but can combo with board change to ensure ample light orbs. High base stats combined with ideal awakenings of grant defensive and offensive capabilities. I am currently waiting to see how lucky I get with for my and then debate on the usage of for both cards. Verche is essentially a lower grade but with hardly any investment required by comparison. Verche is easily skilled up and requires very basic materials to evolve. He drops frequently from countless dungeons, and I used him extensively during my earlier Sakuya days. Apollo now has his superior L/B evolution, but his older Light/Red evolution can still be used to fulfill colour requirements. If you are able to safely cover red, then change Apollo to his other ult evo as he gains another . is the only double orb change (purple and hearts to light) sub that has synergy with and I have always dreamed of owning one. At an 8-turn cooldown, you can ensure a massive light burst of damage to any floor in your way. The drawbacks of using are a lack of along with potentially flooding the board with too many light orbs and thus preventing you from matching 7+ combos. Arthur is probably seldom seen, but his active works as an awkward light maker. His main appeal is his dark sub type (for other rainbow teams), but he is worth mentioning as an option for less developed teams. Due note that he does not provide a and his active is challenging to skill up. Full board changers: The reliance rainbow teams now have on board changers is higher due to higher level content being less forgiving and also possessing status immunity shields. In an ideal world, you would be able to bring 2 to combat orb troll, but that may not always be feasible. Light Kali is pretty much the single best sub for as she has high base stats, , two , a , two , and her full board change to red, blue, green, light, and dark. ‘s active will guarantee at least three of every colour so with her usage, you can in theory proc the board and sweep the boss. She is able to combo her active with Verche and Elia to produce a light-heavy board with red, blue, green also present. If you are fortunate to have two , feel free to use both of them as subs to ensure consistently proc-able boards. However, her active will not remove locked orbs. Chocobo is an overstuffed chicken can be used as a “farmable” board refresh that is essentially the same as but with a longer cooldown a and 1000 HP heal. He is given out for free during the Final Fantasty Collab and may not be available again until its return so I hope you managed to pick one up. Chocobo would be a viable sub on your team provided you can fulfil the other colour requirements. Keiji is a part of the newer Samurai pantheon and he is similiar to in that he has a full board reset, but his active is slightly different and he has inferior awakenings. will guarantee a full board of red, blue, green, light, and dark orb with at least 3 of each kind. Keiji will randomly reshuffle the board to include red, blue, green, light, dark, and hearts in any random amounts. This can potentially produce an un-procable board, but the major upside to bringing him is the ability to make hearts, one turn haste, AND removing locked orbs as his active is a reshuffle, not board change. King Mastering is essentially a poor man’s in that both reshuffle the board randomly. This can result in any combination of the 6 elements and could still result in orb troll. Mastering’s awakenings are quite underwhelming, and the amount of work needed to evolve him is very daunting. Thankfully he is easy to skill up and at 6 turns can be a quick solution to bad boards. Dark Kali fulfils different gaps in your team roster as she has different awakenings and dark typing. The high base stats along with unbindability, , 2 , and awakenings bring more utility to your team. Being unbindable allows to bait out dark binds and passively clear binds from your other monsters. Her active also generates heart orbs and can be used as a way to heal and deal damage. However, you are more likely to only spawn 3 light orbs, but this can be corrected with other offensive actives. It is hard to find fault in either of the Kalis as they both provide an amazing amount of power and utility. The one notable benefit of is that you can refresh the board, heal, and sweep the boss all in one turn. Damage enhancing (either type or orb enhance): These subs augment your already formidable damage output and are able to be stacked on top of orb changers to ensure you can burst through the tankiest of bosses. With the advent of stronger and more resilient bosses, the dependency on bringing damage enhancing subs is at an all time high if you are not confident in your burst potential. It is generally better to bring a low cooldown yellow orb changer as this should be sufficient in providing high combos, TPA, and light orb matches. Athena is another powerful farmable monster who brings an amazing attack value and double . This allows to burst incredibly high and lets her punch through high defence-monsters with ease. Also, having 2 means your team will have 80% resistance to blind attacks! However, has 0 base recovery and her active is a bit underwhelming due to it double dipping and enhancing green as well as light orbs. I tend to only seldom bring my hypermax , but she may get more attention when I need to fill the green slot especially, when it is a no heart spawn dungeon. 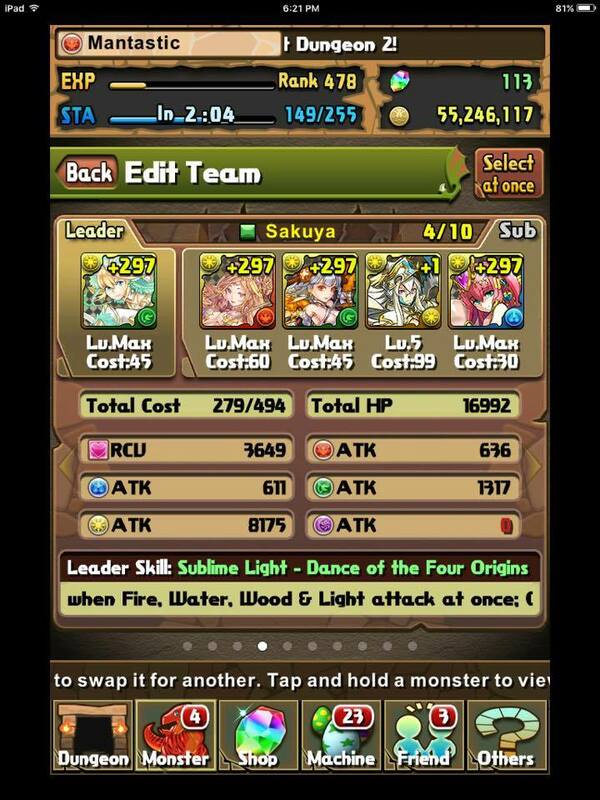 Awoken Venus was my 10th hyper maxed monster and my solution to an offensive blue sub to replace prior to . Venus has only 5 awakenings on a Sakuya team as the row enhance is essentially worthless, but what she does bring to the table is very powerful. Being light and possessing a adds more damage to the team along with having . 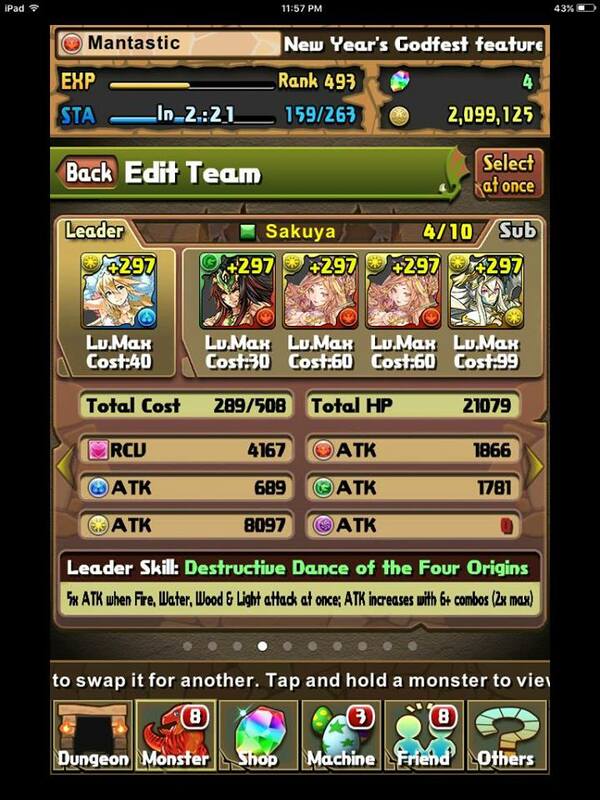 Also, having 2 provides more sustain when stalling and her active ensures a massive burst on only a 5 turn cooldown. ‘s active has the double effect of enhancing light and giving free movement for 6 seconds. This can ensure you maximize your combo potential along with TPA etc. In addition, her enhancements mean she combos exceptionally well with heart to light active and both are synchronized at 5 turns. This active alone pushes your damage to higher levels and can be comparable to type or colour enhance actives, but on a much shorter recharge timer. Izanagi provides synergetic awakenings and on-colour typing for . He is arguably better as a sub due to the dark typing, but his raw power can benefit too. I will most likely not have him on my team because loses her God typing and as such, 2 cards will not benefit from his active. However, if the rest of your team is god based and you are for some reason in a desperate need for a damage enhance or a beefy card to bolster damage passively every floor, is a reasonable choice. His awakenings become very powerful with contributing damage and providing utility and defensive benefits. Kanna, on the other hand, brings more damage than due to 3 awakenings along with providing and 2 awakenings. What sets apart from is her ability to enhance both god and dragon types (as is a dragon, not a god). Although the reliance on burst damage dealers is lower, it can be an option should you feel you need to pack an extra punch along with dealing massive damage every turn with a TPA match. Sun Quan’s active combines a delay and burst which can be a life saver in certain situations. With being able to take advantage of his active, can be a viable sub who can combine offensive and defensive abilities. The and are also nice little additions. Just be careful when team building as he lacks a awakening. Bind clearing: When deciding if you should bring a bind clearing sub, you must determine how dangerous the binds are. If the bind is preemptive and impossible to stall through, then of course you must bring bind removal. However, if the bind will only occur at certain health thresholds or specific turns, it may be best try and burst through the floor instead. Generally speaking, bind removal subs do not bring damage to the team and can feel like “dead-weight” if the binds can be avoided. Lastly, if your team has high recovery and the binding floor is not too dangerous, it may be advantageous to stall it out. In addition, all the following subs are bind immune and can be used to bait out specific binds to provide a free turn. Take all that with a grain of salt as already has bind clearing through her active and awakening. Awoken Amaterasu is a newer evolution that provides bind immunity, 2 , 2 , and a single . These awakenings alone are amazingly impressive, and her active provides a significant heal along with haste. Granted the bind clear may be redundant, but there could be situations in which either you do not wish to use your or it is not ready as is only 8-turn cooldown. Lastly, being bind immune can allow you to bait out green binds safely. 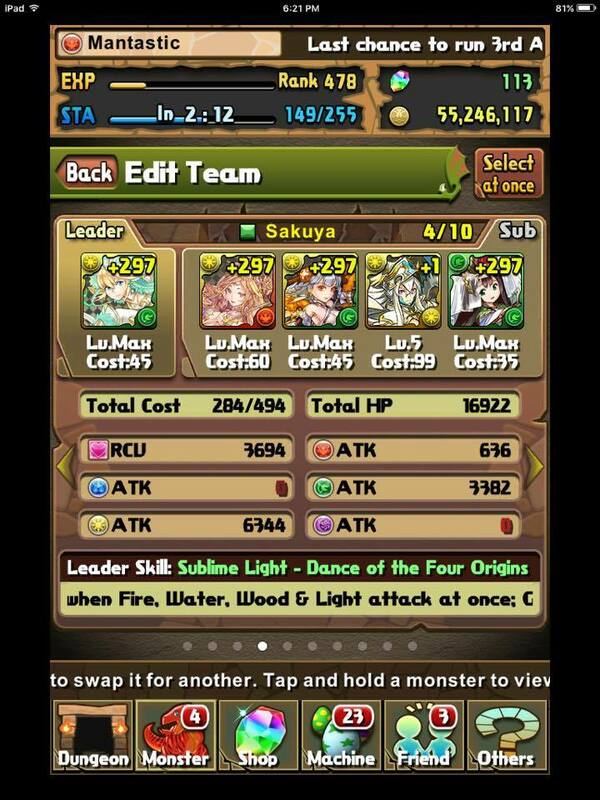 Light Metatron has been the most important blue sub for teams since her ultimate evolution was created. She has fallen from grace due to powercreep, and now her role as the bind clear queen has been overshadowed by ‘s new bind clearing active and the lower need to have a bind clear. still has the best bind clear active as she can remove 3 turns on only a 5-turn cooldown. Other overlooked benefits are her double awakenings, her bind immunity and thus her ability to bait out water binds safely, and the highest base recovery in the game. I have started to develop a love/hate relationship with my as many of the most challenging dungeons cannot justify using her as a sub. This was an issue for my and teams and I had to find a more offensive option for a blue sub. Awoken Isis is not quite as beneficial as you should already have sufficient bind removals; however, she still covers the blue and green slot for rainbow teams. The 15% reduction shield may prove to be situationally useful and is readily available at 3-turn cooldown. She is also bind immune and contributes a and , so she is not a terrible option. Awoken Ceres may not be as ideal due to the readily available bind clear on , but she should at least be mentioned as she covers green and can provide a modest amount of healing. In addition, is also bind immune so can be used to bait out green binds safely. Ame no Uzume is another bind immune, bind clearing sub who also covers the red sub type. I would rank her as the weakest of the bind clearers listed here as she contributes no offensive capabilities, average awakenings (no ), and a very difficult to skill up active. However, her active is unique as it can allow you to easily stall through high damage due to the recovery boost. Green Odin is currently an underwhelming card because his active is very lackluster, but now provides 2 turns of bind removal. His raw stat value and amazing awakenings are not quite offset by the fact that his active is essentially pointless on . High base stats eventually experience diminishing returns as your team reaches more +297s. All that withstanding, Odin can be used as an unbindable stat stick green sub who can heal you 2000 hp every turn with his 4 awakenings. Lastly, his 2 awakenings can allow you to have certain actives ready by a fixed point, and I did use him for my team on my alt account for a brief period of time. Due keep in mind is bind immune and can safely bait out green binds, but his lack of further diminishes his value. Shielding / damage mitigation: These subs provide you with the ability to reduce your damage taken and the shield carries over to the next floor provided you sweep your current boss and the subsequent floor has no preemptive ability. In addition, you can use these shields to reduce damage taken from large preemptive strikes. Lastly, it is far better to reduce damage taken compared to heart generation as shields can allow you to survive hits you could generally not live through. Awoken Susano covers green and red attributes and he alone can allow unrestricted sub options for . His 3-turn shield combined with haste on an 11-turn cooldown allows you to safely tank attacks that would have otherwise killed you. Being unbindable ensures that you are always able to activate Sakuya’s leader skill as she her self is also bind immune. I would say his only weakness I would say is a lack of ,but his double and more than compensate for this. I would rank the dream boat as a top tier sub for and was overjoyed when I pulled him in a recent godfest. Dark Izanami may be the wrong colour for , but her sheer power deserves mentioning. A 35% damage reduction shield for three turns with only a 6-turn cooldown is immensely powerful. She is easily the best farmable shield character in the game, and her triple awakening provides 1,500 hp worth of healing each turn to compensate for her low recovery. In addition, with scaling up to 100x damage, you are most likely going to be matching purple and the damage loss will not be as great as with her pre-awoken form. Lastly, the dark typing can make an ideal choice for all attribute dungeons. Kushinadahime (Kush) provides the single largest damage reduction shield (75%) for one turn on an 8-turn cooldown. You can essentially survive any hit with this shield active, and her awakenings provide a bit of everything including . The major downside is that she is not bind immune, but this is not as great of a concern because of Awoken Sakuya’s bind removal. Being non light based is not as big of a concern now that can reach up to 100x damage. Indra has resurfaced as a powerhouse sub for combo/rainbow teams with his awakenings. His 75% reduction shield is on par with , but lasts for 3 turns instead of 1. Granted this increases the cooldown but can be more valuable in the right situations. Lastly, does not have an awoken evolution so we may be in store for a significant boost in power and viability. Light Izanami is a weaker form of her dark sister, with a worse active, evolution tree, and awakenings. Her only saving grace is being light and contributing 1 . It is still a damage increase and if you only need one turn of shielding, it can be a viable farmable option. One down side is is harder to skill up as she is not a guaranteed drop even on Mythical. Delays / menace: Even with the advent of more bosses having status void shields, delays are still valuable as you can use them to safely bypass different floors while conserving other actives or restalling for skills. In addition, it can be a way to avoid perseverance mechanics as you can bring the boss down to 1 HP and kill on the subsequent turn without being punished by their special execution abilities. Awoken Orochi can be max-skilled to 15 turns and provides an overwhelming 4 turns of delay. This is quite excessive as most things should die within 2 turns but I am sure someone will argue that 4 turns of delay is justifiable. However, as a saving grace, has an unbelievable 4 awakenings which results in amazingly high passive damage with every water two prong activation. This is where you will need to weigh the pros and cons of using an somewhat lackluster active sub who has no awakening and is the wrong colour for teams. He may constrict your sub pool choice, but does provide a substantial blue burst of damage. If given the option (even if max skilled), I do not think I would use on my team as he is slow to activate and somewhat overkill and does not offer much aside from safety on one floor. However, everyone has a different playstyle and expectations so take my own usage with a grain of salt. Echidna has been a staple sub on most rainbow teams as she covers the awkward red slot while providing high recovery and an immensely powerful delay. In addition, she is also very easy to acquire and skill up as she is one of the oldest farmable monsters in the game. Unfortunately, newer content is pushing her out of the meta as most of the difficult floors resist her delay. Nevertheless, still provides three free turns on a challenging floor and every account should have one. Her one saving grace is her ,which combined with provides 60% resistance. Expanding on that, pairing with Athena enables 100% blind resistance; I have used this combination on rare but successful occasions. The 5 Christmas “trash” rolls are actually quite powerful as they share the same active as Echidna and can also fulfil your colour requirements if you pull the correct ones. Regardless, their 3 turn delays are just as valuable and it is worthwhile to pull at least once on the Christmas REM as they are a boon for newer accounts. For further reading as to why is valuable, click HERE. Just bear in mind that they have lackluster awakenings and stats when compared to the newest and flashiest monsters. Gravity: Gravities are starting to come back into style as they can be used to push a boss into specific health percentages and is most useful to either knock them into a favourable colour or to by pass perseverance. With your two actives, you can immediately push a boss to 64% health and it may not be mandatory to bring another gravity; however, I did use Hera-Is to successfully clear a previous challenge 10 dungeon to bypass a 50% perseverance ability. You can read about it HERE. Hathor just received her ultimate evolution and it will granted her a , , and a total of 4 awakening. The ensures 4/5 light orbs will be enhanced and adds significant damage to your team overall. The 25% gravity is substantial and at least starts at 18 turns compared to Hera-Is and her 30 turn non-skilled base form. Situationally you may find yourself using to bypass 50% perseverance abilities on bosses who cannot be delayed. As a saving grace for a situational active, your passive damage will not falter as much when compared to other gravity subs. Awoken Hades is a sub I often overlook even though I own one myself. The 5 second buff to orb movement time in conjunction with a 25% gravity should ensure you sweep the floor with relative ease. His awakenings do not contribute much to overall team utility, but you can abuse his 2 and high base attack to punch through high defence light monsters. I have not used much, but am confident he could be put to better use with certain team compositions. Although his lack of is a large pitfall that needs compensation from your other subs. I may have missed a favourite sub or two, so please leave a comment if you feel there is a card who deserves mentioning. With this extensive list in mind, how do we go about actually team building our ? From my own descend clearing compositions, I always try to bring a mixture of defensive utility and offensive subs to the party, but have lately been leaning more heavily upon board refreshes and survivability and relying on my matching skills to deal damage. Naturally, this did change as I rolled more exciting subs including a second and . That being said, no team is completely fool-proof, and each will have their own weaknesses and strengths. It is up to you to research the dungeon at hand and choose subs that will provide the most benefit. When deciding who to place your plus eggs on, try to determine who will benefit the most (either through TPA) or who will be always present on your team. Some subs I will most likely never replace, such as my single , but others such as have been sidelined. And speaking of dreams coming true, after pulling several godfests after this post, I am finally able to assemble my favourite team! My dream team of is amazing and use it for nearly all my content, but one major pitfall I have is a lack of heart orb generation especially when I use actives and need to sweep and heal on the same turn. Maybe change around or for another to further increase time extend, but I do not know the true potential of a dark Awoken Sakuya – it is simply something else to consider. is a rainbow team and will be susceptible to orb troll and you must have the patience to stall and survive. You should always enter endless corridors to test your damage output (with a two prong match and without) with varying number of combos to give yourself a relative idea of how much damage you can deal. It can be sometimes challenging to accurately predict your damage output as your multiplier goes up significantly with each additional combo. You should always aim to match at least 6 combos in order to trigger a 36x multiplier as well as statistically refreshing your board (18 orbs matched should result in 3 of each element falling down). In addition, you should determine your base recovery (how much healed when matching 3 heart orbs) as each subsequent combo adds 25% healing. For example, 4000 base recovery will heal 8000 HP when matching those 3 hearts and 4 additional combos (5 in total). You will need to stall throughout the dungeon and this information helps you determine if an active is needed. Furthermore, try to make a tentative plan and mental note of which floors you want to use actives. This provides some guideline to your usage and helps you plan out your team composition and awakenings accordingly. When determining how much skill lock resist you should try to achieve, you need to determine how dangerous having your skills locked is. Can you stall through the binding floor without actives? If the answer is yes, you may not have to alter your subs if it hinders your performance on other floors. The same can be applied to monster binds: if the bind will not result in your death, feel free to just stall it out instead of gimping your team with a bind clearing sub. When trying to decide if matching a light TPA or an extra combo, you need to determine how many light awakenings you have and if you are trying to pierce through a high defence monster. If your total team awakenings is equal or greater than 4, going for the additional TPA match is more worthwhile as each match adds 50% bonus damage for that monster. If you are required to pierce through a high defence monster, always got for the TPA match. Mastering will take practice, but is well worth the investment as she can clear all the content in the game. do u know if the coin version off “Ultimate God Rush” have the mythical version off it ? Team is solid outside of Ama as her active is quite redundant when both your leaders already offer bind clearing. Any other options? I just pulled Kirin in today’s player’s choice! Talk about late timing. Wood would have to be either chibi valk or Amaterasu, no other real option. I don’t have Elia, she has NEVER spawned for me, but reincarnation Verche is the next best thing and he even has OE. Here’s my padherder which is updated, I’d love it if you could give me suggestions aside from what I have that could incorporate utility like delay etc. Ah, thanks for the opinion! I guess I’m somewhat glad I pulled the second Kali a few weeks ago. And then almost max skilled her off of all the light jewels I got from farming Kanetsugu until my eyes fell out of my sockets.